Despite good sales prospects, there remains substantial uncertainty related to VAT tax issues amongst retailers as tax controls have been intensified. According to the Polish Statistical Office, retail sales increased 7.3% year-on-year in 2017, with sales of furniture and household appliances even increasing 9.8% driven by robust economic growth and buoyant private consumption (up 4.8%). Dynamic sales growth is set to continue in 2018, with household spending forecast to increase 4.7%. Despite the robust sales performance consumer durables retailers’ profit margins deteriorated in 2017. they are however expected to remain stable in 2018. Since 2016 the government has intensified tax controls and tightened the law in order to increase tax incomes. This means that despite good sales prospects, there remains substantial uncertainty related to tax issues amongst retailers. In 2017 a larger domestic appliances retailer went insolvent due to tax issues, and VAT-related risk remains high for retail businesses in 2018. The implementation of a progressive sales tax that would tax retailers along turnover size (excluding small retailers, but affecting mid-sized and larger retailers) has been postponed until January 2019. The EU commission has raised legal concerns over the law, and Poland has submitted the case to the EU Court of Justice. Payment terms are 60 days on average, but very much depend on the type of goods - from 30 days for electronics and small appliances to 180 days for large appliances. Insolvencies have increased in 2017, and it appears this trend will continue in 2018. The increase is partly due to the introduction of a new restructuring procedure in 2016, which allows more businesses than before to file a proceeding. While still remaining low compared to other industries, insolvencies in the furniture subsector increased significantly in 2017, as this export-oriented segment suffered from currency appreciation and higher labour costs. In this subsector there is high competition and a growing gap between larger players and smaller businesses, the latter often unable to make necessary investments and to increase efficiency. Given the continued sales growth, but also taking into consideration challenges like increased tax controls, higher input costs and rising insolvencies, we have tightened our underwriting stance for the Polish consumer durables retail sector somewhat. 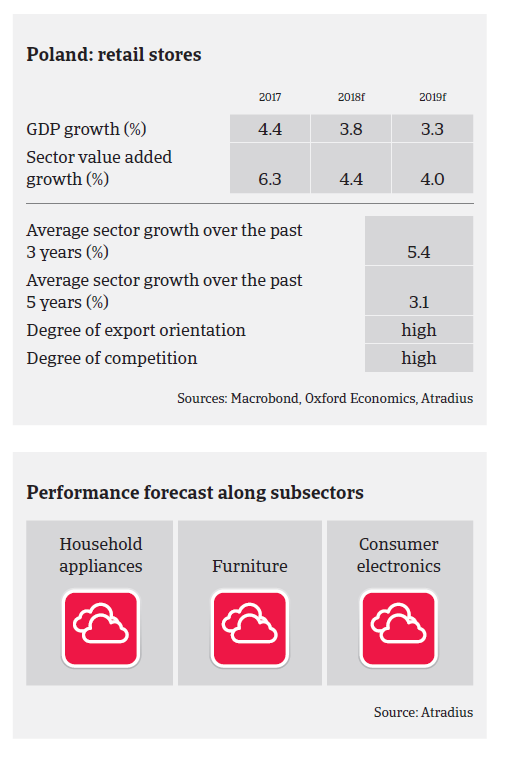 However, the sector performance outlook still remains “Fair” for the time being. Payment experience has been good over the past two years, and steel and metals insolvencies decreased in 2016, with a stable outlook for 2017 and 2018. Despite further growth, Poland is susceptible to a potential end of the Eurozone recovery. Adverse economic policies could dampen investor sentiment.